With roots in race and gender discord, has the “tomboy” label worn out its welcome? An Object Lesson. Many girls, of course, exhibit both girly and tomboy traits, and the infinite shades in between. Nevertheless, the tomboy is an overlooked part of how American society understands gender, race, class, and sexuality. And as attitudes toward all those categories change and evolve, the relevance and appropriateness of the tomboy label is uncertain. By the late 19th and early 20th centuries, the tomboy was everywhere, dovetailing with both women’s suffrage and first-wave feminism. But the tomboy’s popularity was confined to a specific demographic: middle and upper-class white women. Tomboyism became pervasive in the United States in the mid- to late-1800s. In her book Tomboys: A Literary and Cultural History, Michelle Ann Abate explains that the tomboy was a widespread literary trope in this period. And while today’s take on the tomboy is likely to be progressive—bucking of gender norms, encouraging gender exploration, and so forth—the Victorian tomboy didn’t embody any of these traits. During the 1840s and ’50s, when the abolition of slavery began in the U.K. (the U.S. would follow in the 1860s), social elites became concerned about the physical health of white women due to restrictive clothing and a lack of exercise. Amid fears that white people would become a minority as more immigrants arrived and abolition neared, white women were encouraged to lead more active, outdoorsy lifestyles. The tomboy became a perfect cure for white malaise. It would, in theory, better prepare young white women “for the physical and psychological demands of marriage and motherhood,” as Abate writes, and further ensure that the white race would not die out. The tomboy showed up everywhere in pop culture in the coming years, in some cases reaffirming white-supremacist ideas. Abate cites Capitola, the tomboy main character in E. D. E. N. Southworth’s 1859 novel The Hidden Hand, as an example. In the novel, Capitola, who is white, chops off her hair and dresses up as a boy to escape a life of dire poverty. Young Cap’s life becomes easier after her transformation, but she continues to treat black characters as poorly as she had when she dressed as a girl. Abate describes a scene in which Capitola threatens to beat her uncle’s slaves if they don’t listen to her, and notes that Capitola frequently insults her black friend, inadvertently demonstrating the ways that tomboyism was a lifestyle that would benefit white women at the continued expense of black people. The tomboy’s rise coincided with first-wave feminism, in which women fought against the patriarchal establishment for (white) suffrage. But rather than liberate women from the bounds of traditional gender roles, as the modern conception of the tomboy might suggest, the original tomboy was a role built to solidify the vigor of future mothers to white progeny. Though the tomboy’s roots are mixed up in racism, the concept has changed over time. In particular, the tomboy has been a significant identity for queer girls. In her 1999 essay “Tomboys and Cowgirls: The Girl’s Disidentification from the Mother,” the psychoanalyst Dianne Elise notes that more lesbians report having been tomboys in their youth than straight women and girls, for reasons related to sexuality. Elise theorizes that for many straight girls, the tomboy phase ends with adolescence, when young girls become sexualized and inherit a new set of gender-conforming expectations. Yet these expectations can be damaging to a girl’s self esteem and self respect, no matter her sexual orientation, Elise finds. Lesbian tomboys, in her view, have found a workaround: The identity becomes a role of self respect. Today’s queer tomboy reclaims some of the altered gender norms that were once promoted among (white) antebellum girls. Of course, women of various sexual identities continue to be tomboys into adulthood (and many queer women were never tomboys). But Elise’s take—that adolescent gender ambiguity gets left behind when heterosexual teenage girls abandon tomboy ways—suggests that by providing a label that is free from the mandates and judgment of sexual orientation, the tomboy demonstrates that gender expression is not necessarily tied to sexual orientation. Over time, the subversive tomboy became an immensely popular cultural icon. Harper Lee’s beloved 1960 novel, To Kill a Mockingbird, is narrated by the inquisitive tomboy character Scout Finch, who is young enough that her sexuality barely enters the narrative. Instead, she is defined by her exceptional smarts, physical strength, and penchant for asking difficult questions. Later, in the 1976 film Freaky Friday, Jodie Foster plays teenage tomboy Annabel Andrews, a messy, athletic high schooler who prefers playing field hockey and water-skiing than fussing with her hair. Yet a central plot point in the comedy is Annabel’s crush on her neighbor, Boris. In Scout and Annabel, both ostensibly straight young tomboys, two stereotypes are challenged. First, that girls should be girly. And second, following Elise, that being a tomboy implies something about a girl’s sexuality. As various fictional tomboys continued to take center stage in literature and Hollywood, corporations adopted the tomboy for advertising purposes. This trend became particularly apparent during the women’s liberation movement of the 1970s, when stretching the bounds of gender came directly under the national political spotlight. In 1981, a now-famous LEGO ad depicted a young girl with braids, baggy jeans, tennis shoes, and a T-shirt, holding a messy LEGO creation. “What it is is beautiful,” the ad says. The Stayfree ad promises women that they can be on their period but still do “guy stuff.” The LEGO ad sends the message that a girl can still be “beautiful” even if she plays with building blocks instead of baby dolls. Both ads hop on the women’s liberation train, but, as ads often do, feel hollow and oversimplified. Even so, the ads reveal the complexities of gender: It is not something that can be neatly packaged, like hygiene products or toys. As a symbol, the tomboy offers a historical precedent for today’s struggle for gender representation across the gender spectrum. Genderqueer and trans people who present as masculine, feminine, or somewhere in between fight to avoid being pigeonholed into prescribed boxes of “male” or “female.” While a tomboy’s gender is usually seen as generically female, it’s possible that some of the lesbians Elise writes about would choose to identify as trans or genderqueer rather than (or in addition to) seeing themselves as tomboys. The key distinction, of course, is that tomboyishness names a lifestyle and aesthetic, often confined to childhood and adolescence, whereas gender is an identity uncoupled to specific age and interest. It would be irresponsible to retroactively assign genders to tomboys in the past, but it’s worth acknowledging that there may have been deeper questions of identity at play for past tomboys than the term itself accommodates. Today, the increasing visibility of genderqueer and trans people—along with the increasingly flexible nature of gender presentation and discourse about it more generally—further complicates the idea of tomboys. Some feel that “tomboy” is no longer a useful term, given that girls and women are progressively more free to explore their gender expression beyond traditional femininity. If culture’s understanding of girlhood is not exclusive to being “girly,” is a tomboy a tomboy anymore, or just one way of being a kid? But as much as society is warming up to a more nuanced understanding of gender, labels that have served an important purpose are not easily dropped. 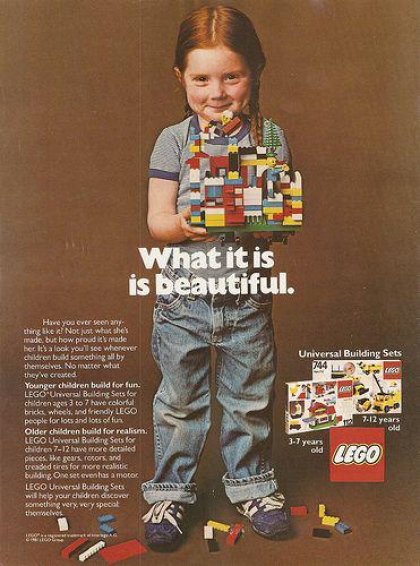 Even if the tomboy’s historical legacy is inextricable from its complex historical relations to race and gender, today many people simply think of tomboys as the adorable girl that LEGO printed in their 1981 ad. It’s a sanitized version of the term that simply refers to a girl who is not afraid to scrape her knees when she plays. Girls will continue to scrape their knees forever, no matter what name people call them. But whether the tomboy label will persist is uncertain. As gender norms change and evolve, it’s fair to wonder whether adults should refer to nontraditional girls as “tomboys.” Some might be happy to see the term go, which would avoid essentializing today’s girls and young women in relation to century-old concepts and ideals, some tainted with racism and sexism. At the same time, others might prefer to describe girls who love baseball and LEGOs as “tomboys” for the foreseeable future, both because and in spite of that history. But given that the word itself already gender-bends, perhaps the best future for the tomboy is as a gender-neutral version of its 16th-century source: a name for children of all sexes and gender identities who romp with spirit and deliberateness. Elizabeth King is a freelance writer based in Buenos Aires. Her work has appeared in the Washington Post, Time Magazine, and Quartz.